Kisimul or Chiosmuil translates as “the rock in the bay” and the origin is obvious from the castle’s location on its rocky island in Castle Bay, on Barra’s south coast. And the castle is in turn the origin of the name of Castle Bay, and that of the village of Castlebay which curves around the north side of the bay. 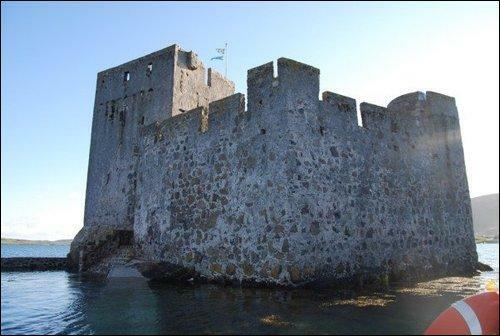 It has been possible to visit Kisimul Castle for many years, but only on a couple of afternoons a week. This all changed on 31 March 2000 when the current chief of the Clan MacNeil leased the castle to Historic Scotland for 1000 years. In doing so he ensured the work of his father to restore the castle will be safeguarded forever: and that the public can visit this remarkable building every day from April to September. The origins of Kisimul Castle are obscure. It is possible that the rock in the bay was fortified as early as the 1000s, and there are claims that one of the courtyard buildings was originally a chapel built by St Cieran, possibly at a very early date. Great place to see and surprising inside. Wee boat trip was quaint and boatmen are friendly. I had a lovely short sail over to the island. The castle was much bigger inside than I had thought it would be. Look out if you are coming in by ferry! A very short sail across with some friendly locals. Well worth a visit. Hard to believe that people have been living in the castle not too long ago and a good view of the sandy beach across the bay.